So many to choose from. I’ll include a full list in a later blog entry. 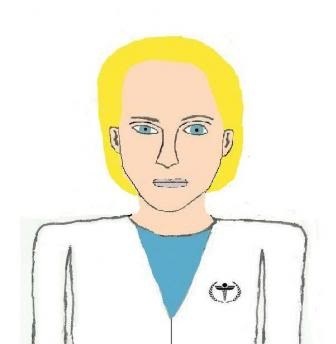 But one of the complex characters I’ve enjoyed writing is the often socially challenged Doctor Aurellan Markalis (named for James Kirk’s sister-in-law, Aurelan, but once I had realized the misspelling, I well into writing Lambda Paz stories and the alternative spelling stuck). Faith Salie as Aurellan Markalis (left) and Sarina Douglas (right). Early on, I had envisioned Faith Salie in the role of Markalis just because her character on Deep Space Nine was somewhat similar–in the role of mute autistic savant in “Statistical Probalities” and a person who, despite her superior intellect, was still a kid in “Chrysalis”. Despite not having much of a social life and having devoted much of her life to academic and career pursuits, she is not discouraged by having been diagnosed at an early age with Asperger’s syndrome. My wife and I are both self-diagnosed “aspies”, who both have extended family who have been diagnosed with this condition, along with when I worked at a school with students at various points on the autism spectrum. So we are greatly aware of its basic traits. We both have seen these traits in ourselves and relatives. What has become most compelling about writing this character is I have a soft-spot for the adorable dorks (mostly I’m married to one). She has a bit of Amy Farrah Fowler by thinking about romantic relationships in very technical terms, a little April Kepner in her tendencies to rant at a mile a minute, plus sometimes being overly candid like Chloe O’Brian or bursting into tears for silly reasons like Jessica Day. These behaviors may be off-putting to others, but Dr. Markalis, at least, strives to improve herself and her social skills and is open to trying new things, making her one of the most human characters in my Star Trek fanon.